If you’ve read our previous articles on various pool tables, you’ll know we’re massive fans of new designs - no matter how wacky they are. The brand new Banana Pool Table is here and it’s more crazy than we could have ever imagined. The unique take on a traditional pool table and striking colours have created a big media buzz around the release of this design. It was designed and created by Cléon Daniel - a British designer based in Dorset. He’s previously released a book ‘Unventions’ which is full of his own hilarious, wacky designs like the Self Replacing Biscuit. His book did very well and as a result, he decided to keep developing his work. This was around the time he came up with the Banana Pool Table design. In an interview with the Daily Mail, Cléon explained that the idea came to him during a train journey and that he immediately wrote his ideas down and planned to work upon a prototype with an old family friend. Work started on the table in May 2012 and was completed 9 months later. It’s handcrafted in the UK from solid ash with a bespoke Banana Yellow coloured cloth. The pockets are fitted with custom made, solid brass pocket plates and high grade leathers with a funky string net underneath. To make the table more personal, you can even get it engraved with your name, a personal message and or add a logo cloth to the design. The Banana Pool Table is available exclusively with us at Home Leisure Direct - the official retail partner for sales in the UK, Europe and Worldwide. The pool table is approximately 80cm high, 140cm wide and 260cm long which makes it the perfect size for any games room. Due to its curved shape, it can easily fit in your spare room or around other pieces you may have. The design of the pool table is great for those looking for a less serious games of pool or those looking for a great centrepiece for social occasions. It’s definitely designed to get anyone up for a game, even if they don’t usually play. 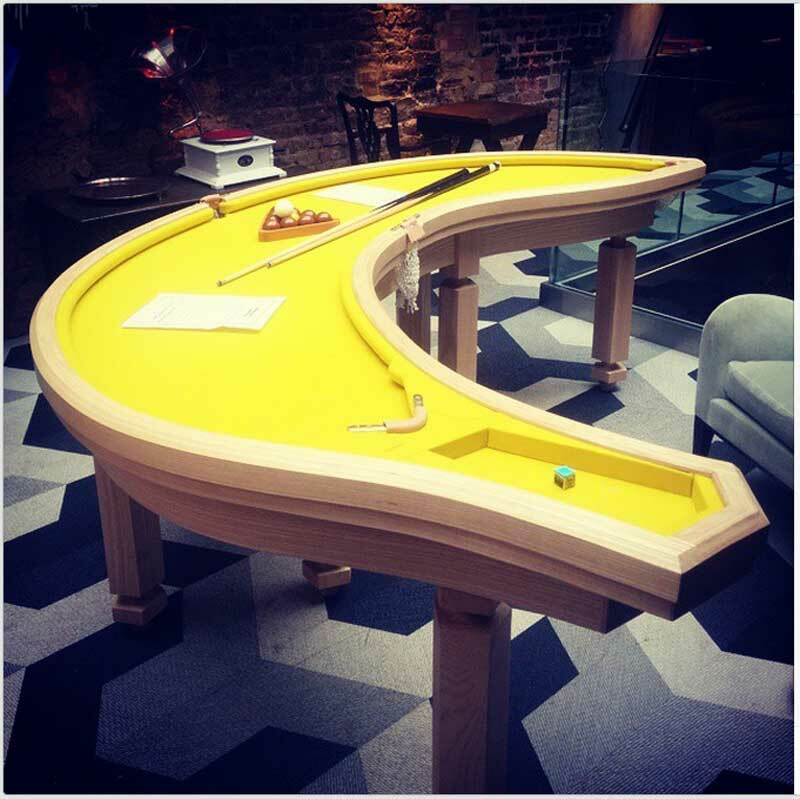 The Banana Pool table is a a great addition to any games room and with it’s bright, yellow colouring it’s going to be an eye-catcher. 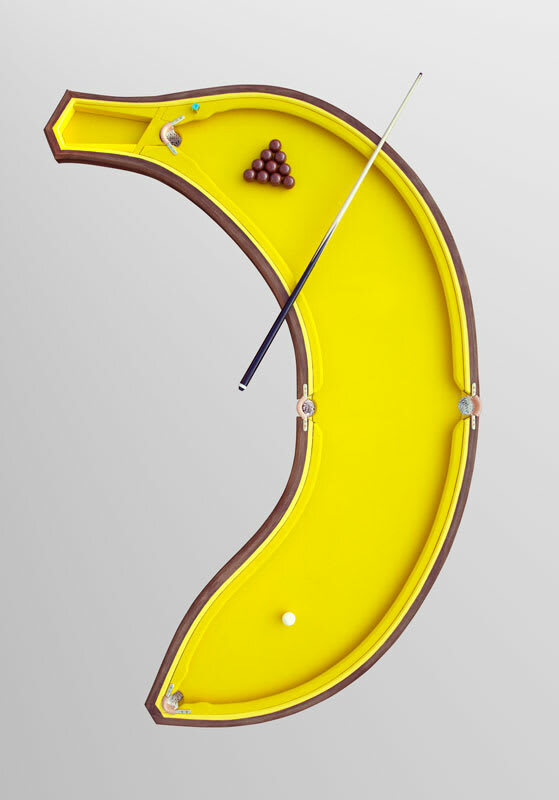 You might be thinking “Wouldn’t a banana pool table be difficult to play on?”, we think not. The curved shape can be used to your advantage to spin the ball from one end to another - making the game more fun to play. You don’t have to be an expert pool player to play this game, it’s more about having fun with your friends and family. If you would like to add this custom pool table to your games room or to your home, don’t hesitate to contact us at Home Leisure Direct. We have teamed up with Cléon Daniel and are currently selling the Banana Pool Table on our website with free delivery and installation.You can call our sales team for free on 0800 622 6464 to speak to a member of our expert team who will be able to answer any questions or queries that you may have.